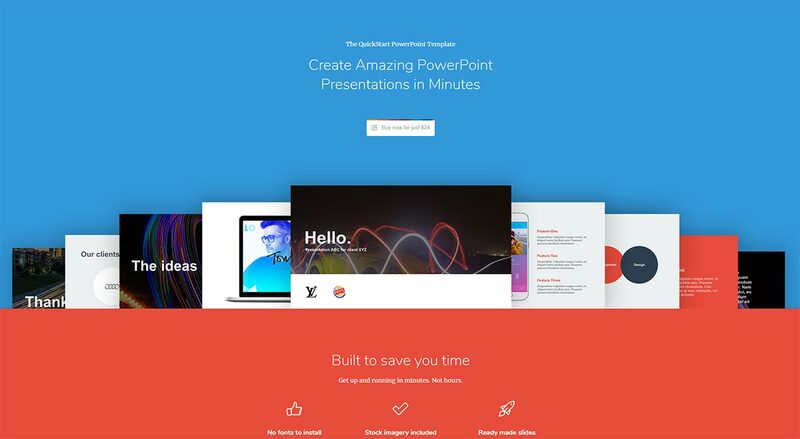 Ditch the bells and whistles and create effective PowerPoint presentations in minutes. Like The Dude in The Big Lebowski, PowerPoint abides. It’s a great tool for assembling presentations and pitch decks. Lively conversations and entire industries surround the PowerPoint – trying to make slides better, helping people prepare materials, debating that the tool is outdated and boring… And at the center, PowerPoint abides. Using standard fonts prevents any snags or downloading delays. A trove of images eliminates the need to conduct time-consuming searches elsewhere. 38 ready-made slides put creators close to the finish line before they’ve begun. Why make the process more elaborate or the slides more sophisticated than they need to be? Simple, bold, useful – this is the approach the Quickstart PowerPoint Template favors. If you’re an app developer, you have desktop, laptop, mobile and tablet display screens at your disposal, to quickly showcase your app. If you have to put together a pitch deck, you have slides designed to make end-to-end assembly painless. From the introduction to clients and services, case studies to team profiles and contact info slides, the Quickstart PowerPoint Template supports your pitch practically building itself. He’s so certain that you’ll appreciate creating presentations using the template that he offers a money back guarantee if you’re unsatisfied. The tool costs $24. Quickstart PowerPoint Template works on both PC and Mac if you have Microsoft Powerpoint installed. There’s also a Keynote version of the template, which you can find here. Sure branding is important, but how much energy do you really want to invest in formatting and design? If you prefer to get straight to the heart of matters, to focus on building your Powerpoint quickly with meaty content, then look to see if the Quickstart PowerPoint Template is right for you by visiting the link here.